The Sri Lankan cabinet has formed a committee to go into the government’s latest proposal on the distribution of shares in the Sino-Sri Lankan joint venture. COLOMBO: The Sri Lankan cabinet has formed a six-man committee of ministers to go into the government’s latest proposal on the distribution of shares in the Sino-Sri Lankan joint venture to be formed to run the deep water port at Hambantota. The State Minister of International Trade, Sujeewa Senasinghe, told the media here on Wednesday, that the government had circulated a proposal wherein the Chinese state owned company, China Merchants Holding Company, will get 80% of the stake (worth US$ 1.1 billion) and the Sri Lanka Ports Authority (SLPA) will get the rest 20%. Ten years down the line, the Chinese company will give up 20% of its holdings to enable others to buy the shares. It will then hold only 60% of the shares. In the meanwhile it would have invested a substantial sum to build the Third Stage of the port project. The government headed by Prime Minister Ranil Wickremesinghe considers this proposal to be fair – a delicate balance between the interests of the Chinese investor and Sri Lankan pride. But since it still falls short of the general demand that the Sri Lankan government or Sri Lankan parties should have the majority holding ,the cabinet has formed a committee of senior ministers to go into it to see if the proposal is indeed in the interest of Sri Lanka, and if not, whether any changes are needed. According to Minister Senasinghe, the Chinese company is alright with the government’s proposal. There was criticism that the Chinese company was getting too much control over a strategic national asset. The Ports Minister, Arjuna Ranatunga, had himself been asking for a 60-40 divide while the Joint Opposition led by former President Mahinda Rajapaksa had wanted the SLPA to get the majority of the shares and have a proprietary right over the port. 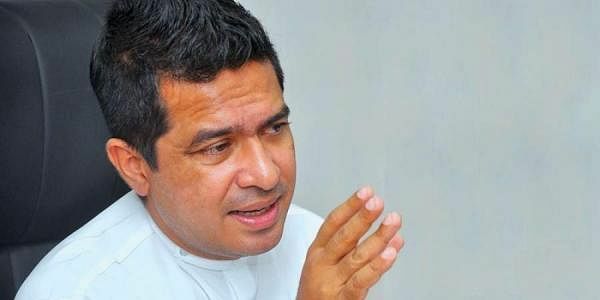 A Joint Opposition MP, Vasudeva Nanayakkara, has even gone to the Supreme Court with a petition against the deal which is to be heard on April 7. But the government’s plea is that it is strapped for cash and in a situation where it is already in debt to China to the tune of US$ 8 billion. Hence the bid to turn the debt of U$1.4 billion in relation to the port into equity with the Chinese company getting 80% of the shares for 99 years for US$ 1.1 billion. Under political pressure it is now ready to water down China’s share to 60% .But this will be after ten years, because the Chinese company will be spending on the Third Phase of the project from now on. The decision to change the terms of the deal accords with President Maithripala Sirisena’s view that any agreement with China (or any other country for that matter) should be such that it does not hurt Sri Lanka’s interest. In fact, he told the visiting Chinese Defense Minister Gen.Chang Wanquan earlier this week, that the agreements signed with China should not harm the “pride, independence and national security of Sri Lanka.” In fact, it is President Sirisena’s explicit opposition which made the government modify its earlier proposal.